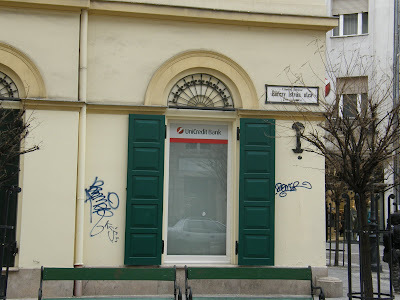 A Ferencziek terén levő, igénytelen küllemű Raiffeisen bankról már írtam, most következzen az UniCredit Bank: a nyóckeres Ghetto Life Kings (GLK, EGON) jól felkenték a szaros tegjüket. Még valami: tévedés azt hinni, hogy ezek kisszarosok. Nem, ezek nyomorult húszas-harmincas emberek, akiknek ez a rongálósdi az egyetlen sikerélmény az életükben. Az EGON/GLK szardenevérei nagyon rászállt az UniCreditre, eat the rich, de ezek leszarják, gettónégerek, végül csak velünk, polgárokkal basztok ki, akik szeretnének egy rendezettebb, tisztább Budapesten élni. UniCredit SpA (BIT: UCG, FWB: CRI) is an Italy-based, pan-European banking organization, with over 40 million customers and operations in 22 countries. The company has its registered office in Rome and general management in Milan. UniCredit's core markets are Italy, Austria and Southern Germany, and it also has substantial operations in Central & Eastern Europe. The UniCredit Group has investment banking divisions in London, Milan, Munich, and Vienna. UniCredit Group was the outcome of the 1998 merger of several Italian banks. 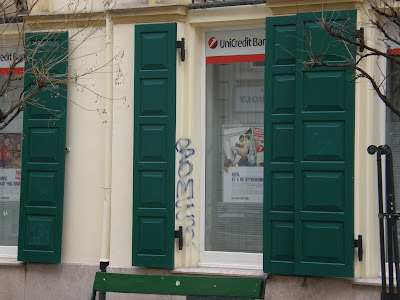 In 1999, UniCredito Italiano, as it was then known, began its expansion in Eastern Europe with the acquisition of Polish Bank Pekao. In 2005, UniCredit merged with the German group HVB, itself formed in 1998 by the combination of two Bavarian banks: Bayerische Vereinsbank and Bayerische Hypotheken-und Wechsel-Bank. Integration with the HVB Group, reinforced by the merger with Bank Austria Creditanstalt in 2000 enabled further growth for UniCredit Group, but was only marginally profitable. Bank Austria Creditanstalt is a major shareholder in Bank Medici AG. Following news that the Bank Medici had invested $2 billion with Bernard Madoff, Vienna appointed a supervisor to run the private bank, raising questions about control of the sprawling group. In 2007, by combination with the Capitalia Group, the third-largest Italian banking group, UniCredit Group consolidated and strengthened its position , but added considerably to its overhead costs. In 2007 two more acquisitions were carried out: ATF Bank which ranks fifth of domestic banks in Kazakhstan with 154 branches, and the acquisition of Ukrsotsbank a retail bank. With these two banks the Group extended its operations in this area to 19 countries (including Central Asia). The Group also controls the Banco di Sicilia Group, one of the oldest Italian bankUniCredit SpA (BIT: UCG, FWB: CRI) is an Italy-based, pan-European banking organization, with over 40 million customers and operations in 22 countries. The company has its registered office in Rome and general management in Milan. UniCredit's core markets are Italy, Austria and Southern Germany, and it also has substantial operations in Central & Eastern Europe. The UniCredit Group has investment banking divisions in London, Milan, Munich, and Vienna.